The US dollar has been marked lower since the middle of last month. It flies in the face strong growth, rising inflation expectations, and greater conviction that the Fed will continue to raise interest rates this year. Moreover, an oft-cited knock on the dollar, the widening current account, may be offset this year by the impact from US corporations repatriating earnings that have been kept offshore. Another weight on the dollar, some suggest, may be coming from the diversification of reserves. Last week's US Treasury report did show that China and Japan, the two largest foreign holders of US government obligations, were both net sellers. Yet there may be less here than meets the eye. When the dollar depreciates in the foreign exchange market, it boosts the dollar-value of the reserves held other currencies. This has the effect of lowering the dollar's share of reserves. US TIC data through November shows foreign holdings of US Treasuries rose by nearly $338 bln last year, of which foreign officials accounted for $242 bln or a little more than 70%. Many countries accumulate dollars by intervening in the foreign exchange market to blunt or smooth the appreciation of their currencies. The IMF's COFER data, which tracks central bank currency reserve, is not inconsistent with some minor diversification, though it may be distorted by the gradual inclusion of the allocation of China's massive reserves. The prospects of the partial shutdown of the US government ahead of the weekend did not unduly weigh on the US dollar, which in fact, closed near its session highs. The occasional shutdown of part of the federal government is an idiosyncratic political quirk in the United States. There have been 18 previous occurrences (since 1977), and a half last for three days or less. The most recent one, in 2013, took a little more than two weeks to resolve. The real economic impact is minor at best. In reality, much of the government continues to function. Less than half the government workers are directly impacted. The government's shutdown though could impact the release of economic data, which in the days ahead was to include the first look at Q4 GDP. Still, to the extent that there is a reduction of hours worked by government employees, the shutdown could see economists shave around 0.1% of their Q1 GDP forecasts per week. The most common element in the narrative of dollar bears appears to be the shift in monetary policy elsewhere. Last week's hike was the third in three quarters by the Bank of Canada. However, since the middle of last year, the Canadian dollar's performance not been particularly strong. It 3.8% appreciation against the US dollar puts in near the bottom among the major currencies. Only the yen, Swiss franc, and New Zealand dollar did worse, and the latter two have depreciated. Last week, the Canadian dollar gained 0.6% against the US dollar, the least among the major currencies. The monetary convergence hypothesis will be tested further in the week ahead. 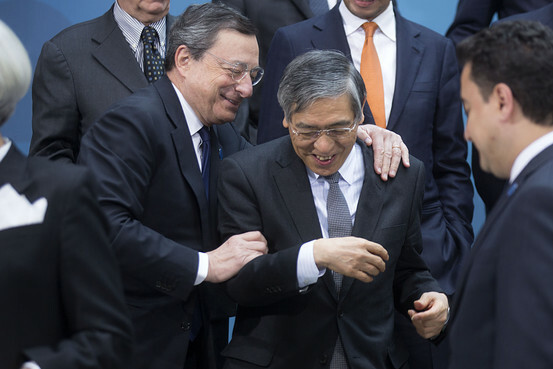 The Bank of Japan and the European Central Bank hold policy meetings. The Bank of Japan recently reduced the amount of long-term bonds is purchased, and the fact that its holdings of JGBs actually declined last month has spurred speculation that the BOJ is moving toward normalization. The ECB has halved its asset purchases (to 30 bln euros a month) and there has been speculation that continued strong growth and the closing of the output gap will prompt a clear end of purchases in September and the increased likelihood of a small deposit rate increase (currently negative 40 bp) at the end of the year. We expect both central banks to push back against premature tightening expectations. Growth is fine and this year's outlook is for another year of above-trend growth. However, officials are still grappling with lower than desired inflation. Although they are measured quite differently, the core CPI rate in Japan and the eurozone both stand at 0.9%. Given the stretched nature of the dollar's technical condition, we suspect the push back against market speculation can be gentle and simply a reiteration of the current policy. The BOJ can point to its adoption of the Yield Curve Control (YCC) in late-2016. This policy evolution leads to fewer purchases of JGBs. It does not mean that monetary policy is normalizing. It is still very aggressively aimed at achieving the 2% core rate target. Outside of JGBs, the BOJ's other purchases, including of ETFs, JREITS and commercial paper, continues. It continues to charge 10 bp for some deposits. The next change in BOJ policy may come from an increase in the target for the 10-year JGB from a tight band around zero to a tight band around 10 bp. Such a move is seen more likely in the second half. Provided it is orderly and part of a broader move against the US dollar, Japanese officials may accept yen appreciation. Previously, it seems that officials begin getting concerned about JPY110, but last week, Finance Minister Aso did not object to the sub-JPY111 market level at the time. We thought the market read the record of last month's ECB meeting too hawkishly. And the meeting was held prior to the news of the disappointing December CPI. With the ECB's purchase plan decided last year through September 2018, it naturally stood to reason that there would be greater reliance on forward guidance to help shape investor expectations. That does not mean that there will be a change next week. The ECB’s information set has not changed significantly since last month, and the staff will not update its forecasts until March. The price of oil is higher, which will, if sustained, boost headline CPI. It will be blunted in part by the rise of the euro. The euro's appreciation will have a larger impact on the core measure, which, although the ECB does not target it, it appears to be part of the operational definition officials are using to help determine whether consumer inflation is on a durable and self-sustaining path toward the target. Draghi may also remind the market of the sequencing that has already been agreed upon. The asset purchases will continue through September, though they may continue depending on the evolution of price pressures. Sometime after the purchases are complete, then rates will be increased gradually. The hawkish elements want a firm endpoint to the purchases, but they do not appear to have the votes in this still-collegiate body. As we have noted the purchases are linked to inflation, and a pre-determined end-date commitment would violate this principle. It would shift the ECB policy from data-dependent to date-dependent. If that were to transpire, against our expectations, we expect it would send the euro sharply higher. Nevertheless, the broader normalization is taking place in the eurozone. Before the weekend, there were two noteworthy announcements by the rating agencies. First, for the first time in two years, a major rating agency, in this case, Fitch, upgraded Spain to A-. It puts Spain in the "A" bucket for the first time since 2012. The other rating agencies are not there yet, but barring a new shock, it would not be surprising if S&P upgraded Spain's BBB+ rating at its late March review. Moody's will review Spain in April and currently holds it at the equivalent of BBB (i.e. Baa2). In anticipation of Fitch's decision, the 10-year premium Spain pays over Germany narrowed to less than 90 bp for the first time since 2010. There may be scope for another 20-30 bp of narrowing in the coming months. The second announcement was S&P upgrading Greece to B from B-. It is S&P's first upgrade of Greece in a couple of years and could hardly come at a better time. The Eurogroup of eurozone finance ministers meets at the start of the week. It will likely approve the next tranche of aid to Greece. Greece is expected to follow this with a bond sale in the coming weeks as it prepares to exit the third assistance program later this year (August). Fitch had upgraded Greece to B- last summer, while Moody's lags with its Caa2 (= CCC) rating. Greek bonds have performed remarkably well. The 10-year yield was near 5.50% at the end of last November and finished last week near 3.85%. Last February the yields were above 8%. The Greek premium over Germany was more than 500 bp in early December and now stands a little below 330 bp, the least since 2010. Much good news appears to have been discounted. The S&P move was a catch-up move to Fitch and the likely reluctance of the Eurogroup to announce fresh debt concessions may spur some profit-taking. Such a backing up of yields that may result could help create a little concession for prospective buyers at the debt auction. Lastly, ahead of the weekend, MSCI warned that the tax changes being considered in South Korea could adversely impact accessibility to Korean shares. The draft legislation proposes to lower a threshold for capital gains tax on equity holdings of 5% of a corporation down from the present 25% threshold The new law would apply to investors from countries that Korea does not have tax treaties with, which includes several offshore centers, where some funds are domiciled, like Cayman Islands, Singapore, Hong Kong, and Luxembourg. MSCI's implicit threat is to cut Korea's position in its global indices. In South Korea, the feedback period on the draft legislation runs through the end of the month, and if implemented, it is not expected until the middle of the year. Korea, which is seeing a surge of initial public offerings, is drawing in foreign funds to its equities. This year, foreign buying is roughly a quarter of last year's net purchases. The KOSDAQ is up over 10% this year and that includes the pre-weekend 2% decline. The won has generally underperformed. The 0.45% gain year-to-date places it near the bottom of the emerging market currencies. Note that at the time of this posting, the decision by the German SPD whether to enter into formal negotiations for another coalition government is still pending. A decision to reject the party leader's recommendation would force either a minority government or new elections, both of which are unprecedented in modern German history. The market appears to have largely ignored the German political logjam, but the prospect of new elections may give the euro bulls another reason to pare with enthusiasm, especially given the prospect a little change since September, and perhaps an even better showing of the populist AfD.